Discussion in 'Navy' started by Dfangsaur, Jun 6, 2018. Does the VLS seem to be out of scale? Given breadth of 4.8m the VLS seems too small. Or very small VLS type? Probably hq10 sized missile with radar direction.. For a max range of about 10 km.. Considering the size and shape (LO) of this 20 ton boat.. I don't think it'll have to independently deal with opponents any farther away..
Or a Khinzal/HQ-17 type SR-SAM. Would make it actually quite potent. I would like to see a larger 120-150t trimaran USV with a single eight-cell 7m UVLS module loading 8 (16?) VL ASW missiles, with an AK-630 mount at the bow and a TAS/VDS combo in the aft section. This vessel could easily be repurposed for AAW by swapping in 32 quad-packed MRSAMs or 8 LRSAMs, or for ASuW by swapping in 8 ASCMs (e.g. YJ-83 with a booster), or for swarming boat defense by swapping in 32 quad-packed small ASCMs. A 052C/D or 055 controlling several of these would be potent force magnifiers during a littoral confrontation or during patrol, each with almost the firepower of a frigate at a fraction of the cost. They would also be easy replacements for the Type 022 in the future. Officials from Chinese state-owned shipbuilder China Shipbuilding and Offshore International Company (CSOC) have revealed technical specifications of a concept for a new 20-tonne armed unmanned surface vessel (USV) during the Africa Aerospace and Defence (AAD) 2018 exhibition in South Africa being held on 19–23 September. The ‘JARI USV Multipurpose Unmanned Combat Boat’, is a 15m long surface platform, weighs 20 tonnes, and is expected to have a top speed of 42 knot and range of 500 nautical miles. The vessel can be armed with a 30mm weapon station integrated with short range surface to air missile, light torpedo tubes, and as well as vertical launch system (VLS). The vessel is also equipped with phased array radars, satellite communication, and variable depth sonar. A prototype of the vessel is currently undergoing testing. PanAsian, N00813 and Dfangsaur like this. PanAsian, duncanidaho, mr.bean and 2 others like this. Another USV from Zhuhai... note the tracks. 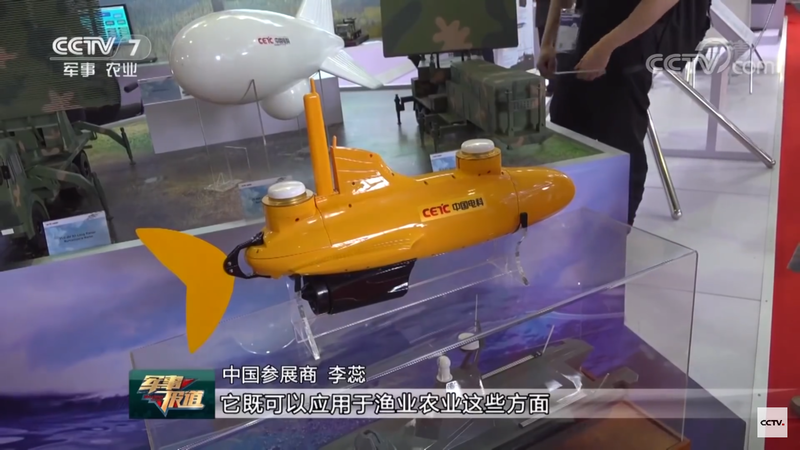 In the background, more USV models can be glimpsed. N00813, PanAsian, mr.bean and 2 others like this. A very edited video of a CHinese USV firing a missile, an ASM, I believe. A few more high-resolution images of unmanned patrol crafts from Zhuhai. N00813, jobjed and Bltizo like this. The Chinese shipbuilder China Shipbuilding and Offshore International Company is developing a small unmanned surface vessel that China wants to function essentially like the uninhabited baby brother of a U.S. Arleigh Burke destroyer. The JARI USV is a 20-ton, 15-meter boat that is orders of magnitude smaller than the People’s Liberation Army Navy’s manned Type -55 destroyer but has all the same mission areas: anti-submarine, anti-surface and anti-air warfare. A model of the drone was on display at the International Defense Exhibition and Conference in Abu Dhabi. A drone that has the option to use fish like motion as propulsion.